It is all about pumpkin! Pumpkin enchiladas and pumpkin pie as a matter of fact! 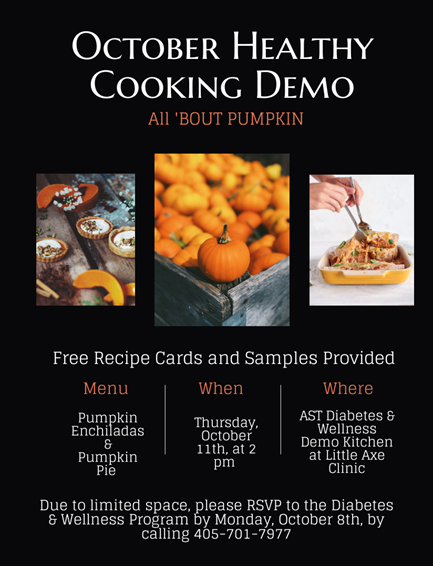 The Diabetes and Wellness Program is hosting its monthly cooking demonstration on Thursday, October 11th at 2:00 P.M. at the Little Axe Health Center's Diabetes and Wellness demonstration kitchen. Due to limited space, please reserve your spot by Monday, October 8th by calling (405)701-7977. Free samples and recipe cards are provided. I appreciate the wide variety of services that are in one location. I would recommend this clinic to others because it is convenient and the staff is compassionate. I enjoy my visits because of quality care.